Tucked in the lobby level of the Ramada Chelsea Hotel, Spice Restaurant is not less than a heaven for Indian and Pakistani food lovers. This venue not only serves high quality and delectable Indian and Pakistani dishes, but also provides a little culture that will remind the guests about their motherland. In addition to this, live entertainment during dinner hours is also takes place that help lift the atmosphere and ‘Asianess’ in this restaurant. 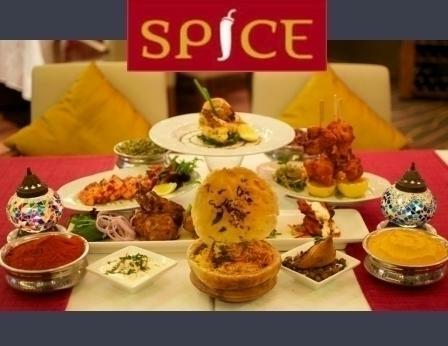 So leave all your tensions behind and take pleasure in the Asian delicacies and cosy environment of Spice Restaurant. The location of this eating place is central, as it is situated in the district of Al Barsha. Therefore, people from different corners of the city would not face any problem in stopping by this spot to consume food or have a drink. As far as the products and services of this eatery are concerned, people can relish very traditional Indian and Pakistani cuisine on this site. They can consume these Asian delicacies, while listening to the live music playing in the backdrop. In drinks menu guests will also find fine array of alcoholic beverages, aside from regular drinks. Guests usually order these drinks during or after having the meal in order to boost the taste. Other features of this eatery include brunch service and private dining facility, which is a rare combination. However, private dining area is available only on advance booking. The lunch at this eating place is served from 12:30 pm to 3:00 pm and guests can relish dinners at this venue from 7:00 pm till 1:00 am. This restaurant opens seven days a week. Ramda Chelsea - Al Barsha, Mall of Emirates Sheikh Zayed Rd - Dubai - United Arab Emirates. Mall of the Emirates Metro Station 1 will best suit the visitors of Spice Restaurant, as it is just 1.6 kilometres away from it and on foot a person can easily bridge this gap in 20 minutes. To reach this restaurant from Mall of the Emirates Metro Station 1, patrons should head in the southeast direction and then turn right. After that they should take slight left turn, before making a turn on the left side that will guide them to the destination on the left side. Al Barsha, Lulu Supermarket 2 bus stop is 400 metres far from the Spice Restaurant at Ramada Chelsea Hotel that makes it 5 minutes walking journey. Bus numbers 93 and F30 serve this stop. If a bus user head in the northwest course from this bus stop and then turn left, before making a right turn. This will lead the bus user to another turn that goes towards the left side from where pedestrian will turn right and find the destination few metres away on the right side. Follow directions.